Cirondo is a rare breed - a new board game that won't be stuffed in the cupboard under the stairs after a month of buying it. 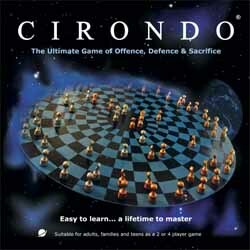 The easiest way to describe Cirondo is a cross between Chess and Draughts; only simpler to get to grips with and almost impossible to master. What's unique about this game - and is actually a feature that makes this perfect for everyone from the very young to the very old - is the fact that while the rules will take about five minutes to become imbedded in your brain, you can probably spend the rest of your life trying to master it. This means that an adult who enjoys the occasional game of chess can take on a younger player and still stand a better than average chance of being beaten. Or, you can spend the next 20 years trying to master it, only to have someone come along whose never played it before who stands a pretty good chance of beating you. It's all about keeping your eyes open and misdirecting your opponent to a different part of the board so that they don't see your strategy. There are so many variable and so many ways that you can beat your opponent into submission that you will never bore of playing this game. Take you eye off what you are doing for a second, have a lapse in concentration on your strategy, and you will soon be gnashing your teeth as your opponent takes that valuable piece. And no expense has been spared with the presentation. There's no flimsy board and plastic counters here. No, you get a good quality board and some heavy metal pieces - although I noticed that the paint had flaked off some of the red and blue pieces as they'd obviously been bashed around in transit. 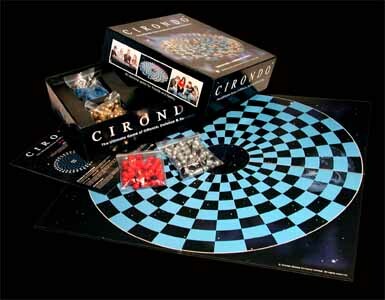 If you want a fun, challenging game that all the family can play then you should pick up a copy of Cirondo. This is one game that every home should own.